Richard Wagner (1813-1883) was the most influential composer of the nineteenth century and one of the most influential composers in the history of Western art music. A composer almost exclusively of operas, Wagner revolutionized the dramatic scope and staging of operas and greatly extended the harmonic language and formal structure of operatic music. Wagner’s greatest artistic achievement was his tetralogy of operas collectively known as Der Ring des Nibelungen (The Ring of the Nibelung, 1848-1874), which includes (in order of performance) Das Rheingold (The Rhinegold, 1854), Die Walküre (The Valkyrie, 1856), Siegfried (1871), and Götterdämmerung (Twilight of the Gods, 1874). In normal parlance, this work is generally referred to as The Ring Cycle, or just The Ring. Even if you have never seen a live or video performance of a Wagner opera, you have undoubtedly been exposed to Wagner’s music. “The Ride of the Valkyries” (from Die Walküre) occurs in the Air Cavalry scene from the movie Apocalypse Now as well as a famous Bugs Bunny cartoon in which Elmer Fudd sings the immortal line “Catch me a Wabbit.” The Alt Right podcast The People’s Square uses “Siegfried’s Rhine Journey” (from Götterdämmerung) as its theme music, and several days ago, Counter-Currents published a video on Wagner that began with the Leitmotif (leading motive or theme) associated with the giants Fasolt and Fafner, who appear several times throughout The Ring. So much has been written about Wagner’s life and career that it is very easy to find reading material online, at local libraries, and at bookstores. What I would like to do in this article is to present a practical guide to approaching The Ring for the first time, a step-by-step method towards understanding the textual, musical, and dramatic structures that Wagner employs. Do not worry if you are unable to read music. The musical devices and structures that Wagner utilizes can be understood without any musical training with just a small amount of directed listening. Wagner was unusual in that he wrote all of the libretti (that is, the written texts) of his operas. He based The Ring on a variety of ancient German, Norse, and Icelandic sagas and myths. You may notice some similarities to the story of The Ring in certain events that occur in J. R. R. Tolkien’s The Lord of the Rings. This is because Wagner and Tolkien were using some of the same source materials. Without knowing any German, you may notice that oftentimes there is considerable use of alliteration, that is, successive words with the same initial consonant sounds. In German this is called Stabreim, and Wagner used this literary device a great deal, because in the nineteenth century it was believed by scholars that Stabreim was a constant feature of medieval German and Anglo-Saxon poetry. Although much is made of the Wagnerian concept of the Gesamtkunstwerk (the total work of art) in which music, poetry, drama, and the visual arts are united into a seamless, holistic totality, it is more accurate to state that music functions as the primus inter pares in this union of the arts. Indeed, an oft-overlooked concept of Wagner’s is that of die dichterische Absicht (the poetic intent), which simply means that the poetic intent of a dramatic text can only be made manifest when it is attached to music. It is the music, then, for Wagner that actualizes the meaning of the text. For a series of operas with a combined performance time of over sixteen hours, the basic plot of The Ring is remarkably straightforward. Its complexities arise from the many different layers of interpretation that the story inspires. The Ring follows the trajectory of classical Greek tragedy in which the hero suffers a complete reversal of fortune; it is also a tale of cultural degeneration and the fate suffered by those who acquiesce in the suborning of deviancy; finally, it is a story about the necessity of fulfilling marital, family, and contractual obligations. The Rhinegold begins with a trio of beautiful Maidens swimming in the Rhine River who are tasked with protecting a horde of gold that is imbued with magical properties. They are espied by the hideous dwarf Alberich (the Nibelung after which the tetralogy is named), who lusts after the Maidens. The Maidens reject Alberich’s advances, and Alberich tries unsuccessfully to steal the gold in revenge. The Maidens tell Alberich that the gold may only be possessed by someone who forswears love. Alberich renounces love and runs off with the gold. 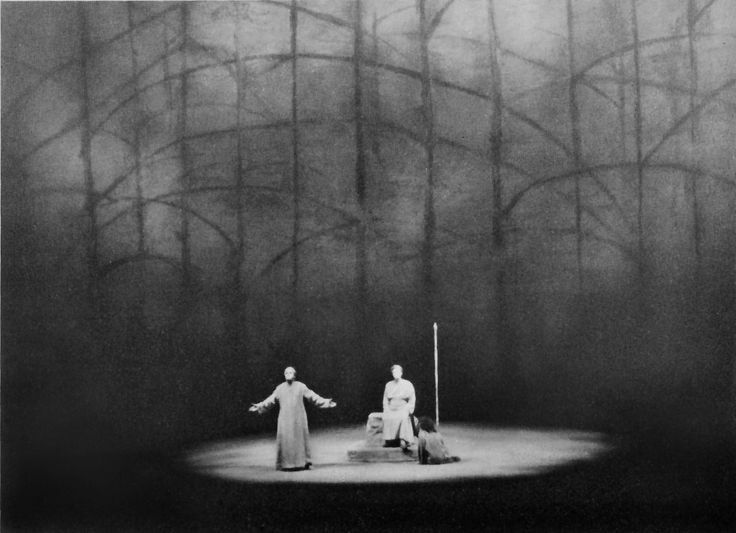 The scene then shifts to outside the recently completed palace of Valhalla, where Wotan, the chief of the gods, and his wife Fricka are admiring the new palace of the gods. Fricka berates her husband for promising her sister Freia, the goddess of love, to the giants Fasolt and Fafner as payment for their construction of Valhalla. Wotan tells Fricka not to worry, as he has no intention of giving Freia to the giants. When the giants arrive and demand Freia as payment in fulfillment of their contract, Wotan and the trickster god Loge get the giants to agree to accept a ring made of the gold stolen by Alberich in lieu of Freia. The giants agree and take Freia away as a hostage. Freia’s absence begins a process of physical degeneration among the gods, who are denied the restorative powers of the golden apples produced by Freia. We then shift to the underground abode of Alberich, who puts on the Tarnhelm, a magical helmet that makes its wearer invisible. Wotan and Loge arrive, and Alberich reveals himself and the magic ring made of the Rhinegold that gives its owner unlimited power. Loge asks Alberich how he will be able to keep the ring from being stolen by a thief. Alberich dons the Tarnhelm and turns himself into a dragon. The gods then ask Alberich to turn himself into something smaller, and Alberich turns himself into a frog, thereby allowing himself to be captured by Wotan and Loge. The gods tell Alberich they will only release him if he pays a ransom. This eventually includes all of Alberich’s gold, the Tarnhelm, and the ring. The gods are then forced to give all of the booty, including the ring, they have acquired from Alberich to the giants in order to free Freia. The giants get into a fight over possession of the ring, and Fafner then kills his brother Fasolt. The opera ends with the gods crossing a rainbow bridge into Valhalla. The joy of the moment, however, is permeated with a sense of foreboding that events have been set in motion that will prove destructive to the gods. The Valkyrie begins in a forest in which a wanderer by the name of Siegmund comes upon the hut of Hunding and his wife Sieglinde. Sieglinde becomes infatuated with Siegmund, drugs her husband’s drink so that he passes out, and then proclaims her love for Siegmund. They eventually come to the realization that they are in fact brother and sister, but nevertheless, they double down on their mutual declaration of love. When Hunding becomes aware of his wife’s infidelity, he challenges Siegmund to a battle. Aware of these events, Wotan dispatches his daughter, the Valkyrie Brünnhilde, to make sure that Siegmund defeats Hunding in the ensuing battle. Fricka then intervenes and tells Wotan that he has disgraced the gods by sanctioning an incestuous relationship. Wotan then recalls Brünnhilde and tells her that she must now ensure that Hunding defeats Siegmund. Brünnhilde, however, defies her father and protects Siegmund, only to have Wotan appear at the last moment to shatter Siegmund’s sword, thereby allowing Hunding to kill Siegmund. An enraged Wotan then kills Hunding. Wotan pursues the disobedient Brünnhilde, who is helping the pregnant Sieglinde to escape. Wotan catches up with Brünnhilde after Sieglinde has disappeared into the forest. Wotan punishes Brünnhilde by putting her to sleep and placing her on a sheet of stone, surrounded by a magic fire that can only be broached by a hero who does not know fear, who can then awaken her with a kiss. Wotan tearfully kisses his daughter and then departs. Siegfried begins with the giant Fafner using the Tarnhelm to transform himself into a dragon. Siegfried, the son born of the incestuous relationship between Siegmund and Sieglinde, is now a grown man and has been brought up by Mime, the brother of Alberich, who has concealed the boy’s true origins from him, claiming that he is his father. He is hoping that he can use the strong Siegfried to take the ring from Fafner for himself. Siegfried tells Mime to reforge a sword that Mime had been working on previously, and then goes off into the forest to search for Nothung, a sword with magical properties that had belonged to his father, Siegmund. Wotan, now in disguise, confronts Mime and Alberich. All three are desirous of obtaining the ring. Mime believes that, after Siegfried defeats Fafner, he can then kill Siegfried by offering him a poisoned drink. Siegfried finds the pieces of the sword Nothung and reforges the sword to its former glory. Siegfried then confronts the dragon Fafner and slays him by stabbing the dragon in the heart. Siegfried accidentally ends up tasting the dragon’s blood, which gives him the ability to understand the language of the Woodbirds, one of which tells Siegfried to beware Mime’s treachery of Mime. Siegfried retrieves the ring and the Tarnhelm, and is then confronted by Mime. Siegfried kills Mime, and the Woodbird tells Siegfried of the sleeping maiden who is surrounded by a ring of fire. Siegfried then goes off to find Brünnhilde. Wotan then meets with Erda, the Earth goddess, in which he explains to her that Brünnhilde is being punished for her disobedience and that he longs for the end of the gods. Siegfried appears before the sleeping Brünnhilde, and when Wotan attempts to block Siegfried entering the ring of fire, Siegfried shatters Wotan’s spear with a stroke from Nothung. Since Siegfried is a hero who does not know fear, he is able to enter the ring of fire and awakens Brünnhilde. The two pledge eternal love. Twilight of the Gods begins with the Norns, Erda’s daughters, weaving a rope of destiny. The Norns retell the events of the previous three operas and give some details of Wotan’s backstory. The rope they are weaving abruptly breaks, and the Norns predict the destruction of Valhalla and the end of the reign of the gods. Siegfried is out hunting and comes across the hut of Hagen and his half-brother Gunther and half-sister Gutrune. Feigning hospitality, Gutrune, who desires to marry Siegfried, gives Siegfried a drugged potion that makes him forget Brünnhilde. Siegfried falls in love with Gutrune and offers to help Gunther win the hand of Brünnhilde. Siegfried uses the Tarnhelm to disguise himself as Gunther. He then kidnaps Brünnhilde and takes the ring (which Brünnhilde had been safekeeping for Siegfried). Now back at Hagen’s hut, Siegfried returns to his original form. Brünnhilde is devastated by Siegfried’s betrayal, and Hagen and Gunther then conspire to kill Siegfried in order to obtain the ring. Hagen gives a drugged potion to Siegfried and tells Siegfried that it will help him to remember his past. As Siegfried recalls his love for Brünnhilde, Hagen stabs him in the back with his spear for being an adulterer, and Siegfried dies. Hagen and Gunther return with Siegfried’s body and get into an argument over possession of the ring. Hagen kills Gunther, Gutrune curses Hagen, and Brünnhilde orders a funeral pyre to be built for Siegfried. The pyre is lit, Brünnhilde mounts her flying steed, Grane, and plunges into the flames of the funeral pyre. While this is going on, Valhalla is consumed in flames, the Rhine bursts forth from its banks, and Hagen leaps into the Rhine in pursuit of the ring. The Rhinemaidens drown Hagen and the ring is returned to the Rhine. Valhalla collapses around the assembled gods. The twilight of the gods has finally come to pass. Wagner used a series of short melodies called Leitmotiven (leading motives) that represent characters, places, things, and concepts. He used these in a consistent manner throughout the operas and they are very useful to keep track of the action since they are so readily identifiable, even for those individuals without any musical training. Wagner’s music can be described as continuous melody. In an earlier work like Don Giovanni, for instance, Mozart employed a format called “number opera,” which consists of an alteration between arias (solo melodies with orchestral accompaniment written in strict rhythmical meters) and recitatives (rhythmically free melodies more akin to the rhythmic nature of everyday speech generally accompanied only by a keyboard instrument). Wagner completely abandoned the number opera format, making his works extremely challenging for the performers from a physical standpoint as well as a musical one. Wagner was extremely effective at depicting in music the dramatic interplay between characters. He was a master at what is called counterpoint (or contrapuntal music), in which multiple musical lines that are independent of each other rhythmically appear simultaneously. The dramatic tension between characters was also depicted musically by Wagner’s use of suspensions, that is, a chord containing a non-chordal tone that causes a dissonance that is then resolved into a consonant sound. If you sometimes hear a chord that has a sound that seems out of place for a moment, you are probably hearing a suspension. The orchestra that Wagner employed was very large, numbering close to one hundred twenty performers. Contrast this with the aforementioned Don Giovanni, which was composed for an orchestra numbering around forty to forty-five performers. The huge orchestra that Wagner employed allowed for a very large gradation in musical dynamics (the contrast between loud and soft) as well as an exponential increase in the variety and combination of musical timbres (the quality of the sound, that is, the differences in tonal properties of different instruments playing the same pitch). Attending a performance of The Ring is not just a musical and dramatic experience, it is a psychological event as well. There is a great deal in the structure of The Ring that occurs at the macrocosmic level, or what one might call the meta-formal level. The most important musical form in the eighteenth and nineteenth centuries was called sonata form. Without going into much detail, the major feature of sonata form was the contrast of two tonal areas. In a shorter work, such as a movement from a Mozart symphony, it was easy even for those without musical training to follow the course of a sonata form because there were two different melodies of very different character that were used in the music of the two tonal areas. Sonata form was infinitely flexible, and quite often the opening of a symphony might have a section in a tonality different from the two tonal centers of the sonata form in order to create suspense and to create a feeling of mystery and ambiguity. In essence, the four operas of The Ring constitute a gigantic meta-sonata form. At the beginning of The Rhinegold, there is an extended arpeggiation on an Eb Major chord. This serves on a microcosmic level as a representation of the undulating waves of the Rhine River, but it also establishes Eb as a tonal center, but it seems to be going nowhere. Suddenly, the Rhinemaidens and Alberich appear and the action of the opera is off and running. When we get to the second scene with the gods before Valhalla, the key of Db becomes the tonal center, and it is indeed this key in which The Twilight of the Gods ends, thereby giving The Ring a formal harmonic unity like that of any eighteenth-century symphony, albeit on a much grander scale. While it is easy to perceive Wagner’s use of Leitmotiven to represent characters and so on, the use of meta-structural devices is only perceptible to the subconscious, yet the audience’s intuitive grasp of subliminal formal structures is an essential element of The Ring’s enduring appeal. Wagner was a master of theatrical stagecraft and wrote copious instructions on the manner in which his operas were to be staged. In fact, the first complete performance of The Ring took place at the Wagner Festival House in Bayreuth, Germany, which was built to the composer’s specifications. The Festival House is unusual in that the orchestra does not perform in a lowered area at the front of the stage, but is actually hidden beneath it. Wagner wanted this innovation so that nothing distracted from the action on stage. While the complexities of Wagner’s operas do not always permit every opera company to adhere to Wagner’s stage instructions exactly, until the 1960s, most stagings of The Ring tried to follow the general course of Wagner’s artistic intentions. Wagner himself realized that technical innovations over time would allow for changes to his original theatrical designs. Indeed, the operas of The Ring were among the first to take advantage of the innovations in stage lighting that were afforded by the invention of electric lights. After the Second World War, the reputation of Wagner’s operas suffered from their connection with Hitler. The Bayreuth Festival House was almost closed by the Allies and the future of the yearly Wagner Festival was in grave doubt until Wieland Wagner (1917-1966), the composer’s grandson, came up with the idea of de-emphasizing the Germanic elements of The Ring, instead utilizing a minimal staging in which the action occurred on large disks onstage placed at oblique angles. Wagner’s Parsifal, as staged by Wieland Wagner. While Wieland Wagner’s productions only minimized the stage apparatus used in the operas, later productions have done great violence to Richard Wagner’s artistic intentions. It is sad to state that it is almost impossible today to find a good production of a Wagner opera in Germany. If you’re going to attend a live performance of one of Wagner’s operas, you need to do your homework beforehand and make sure that the director respects the artistic intentions of the composer. The Met’s stagings of The Ring directed by Otto Schenk  are a gold standard, and are readily available on DVD. A very good performance that is available on CD is The Ring conducted by Georg Solti in the 1960s, which was the first complete studio recording of the entire Ring to be released on LPs. It has been released on CD and the liner notes give the musical notation for the various Leitmotiven. Many performances of The Ring are also available on YouTube. Nothing, however, can top the aesthetic experience of seeing and hearing Wagner’s Ring performed live. This should be on the bucket list of every White Nationalist.